When the barbecue season comes around, many of us prepare to have fun sharing summer evenings with friends and family eating food outside. 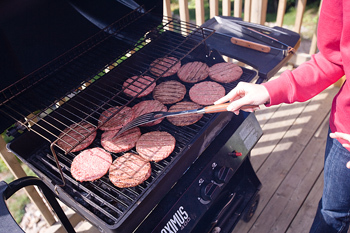 No matter whether you use your barbecue just occasionally or every day as we do, there are a few things you can do to make sure your barbecue accessories are environmentally friendly. The number one way to make your grilled meals more eco friendly is to avoid using disposable cups, plates and cutlery. Although it's convenient to make use of plastic items - especially when eating outside or when many people are around - it really isn't good for the landfill! Instead, you might choose longer lasting plastic items that can be used a number of times. Another alternative is to go for compostable items. For example, you can get compostable barbecue plates that will biodegrade in the garden once the party is over! Bamboo dishes and cutlery are not only eco-friendly but they're attractive and cheap. They've come down in price a lot in the last two years, making them a good option for picnics, barbecues and camping. Being unbreakable they are a good alternative to plastic or paper dishes for children too. Similarly, disposable grills have also become popular for those who want a small, portable option. There are many reasonably priced, longer lasting alternatives in store around the summer time if you want to do your part in reducing waste. More and more stores are now offering firelighters made from renewable materials, to help make your barbecue more eco friendly from the very start. These green barbecue accessories can be used in place of traditional paraffin or wax firelighters. You can be even more frugal and eco friendly by making your own firelighters, using egg cartons and fluff and those candle stubs hiding in the kitchen drawer. Just melt the candles (in a double boiler over hot water to be safe), stir in the dry fluff from the washing machine filter and fill the pots in an egg carton. When the wax has hardened you can tear the pots apart to make individual lighters. To use them put one or two in amongst the kindling in your barbecue or fire pit and light the cardboard with a match. They'll burn slowly, giving the kindling time to catch and get your fire going. If you're buying new accessories for your barbecue, think about whether you can get them recycled. Want a new BBQ chair? Consider making (or buying) one that's recycled from old materials. Or perhaps you're looking for a new apron or BBQ gloves? Again, you can find these in recycled form. You'd be surprised to know that even old plastic can be used to create fantastic gloves! Look online for free instructions and patterns or visit your local hardware shop and see what free workshops they have on offer. Other ways to make your summer barbecue more eco friendly include looking for charcoal made in sustainable forests, using coal instead of flames to cook your food, using left over wood ash on the garden and sourcing your meat and vegetables locally. Do your part and help the environment while you enjoy your barbecue this summer! It's much better to compost most of your wood ash - at least, over here in WA with Perth's gutless sand. It clogs up the soil. We used wood ash for our paths between the vegie beds ie. cinder paths in the UK and just kept adding to them!